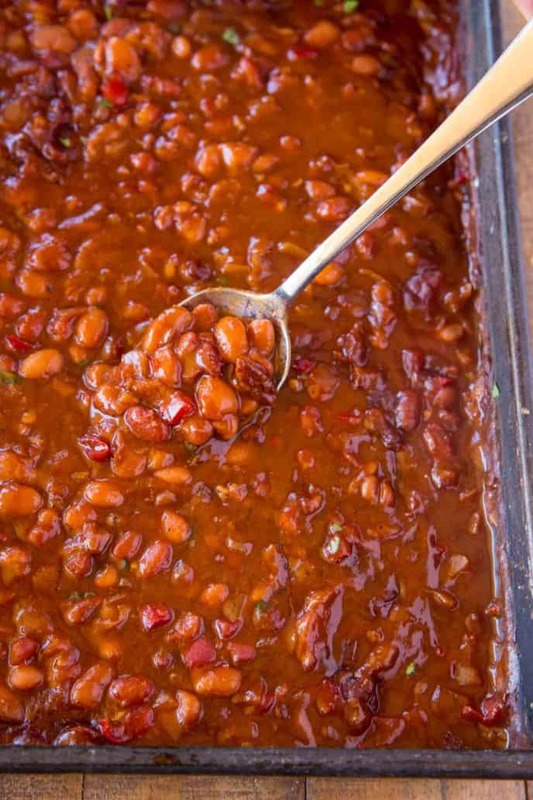 These are the BEST EVER Baked Beans that have won 4 bbq competitions! Prepped in just 15 minutes that are going to be the hit of your summer barbecue. 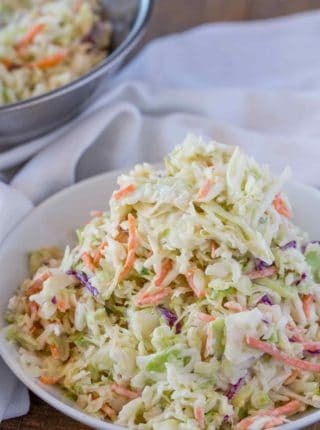 Just like with the immediately popular Super Crispy Fried Chicken, BBQ Pulled Chicken and Easy Pulled Pork you can serve this summer favorite Coleslaw, Macaroni Salad and Pasta Salad for the perfect summer cookout! That’s right, these southern baked beans have won 4 competitions. And I’m not even talking about the office pot luck competition, we are talking about fun local bbq competitions. Back in the day before kids we used to love going to bbq competitions. There were so many fun local ones and some huge ones. Finding our favorites was a job we took seriously. We started entering these beans into them a year before we moved and reality set in with full time careers and kids. How do you make baked beans? You’d be surprised at how easy this recipe really is! They’re sweet, thick, rich, deeply flavored with molasses, a bit of salt from bacon and a hint of spice from the hot sauce. 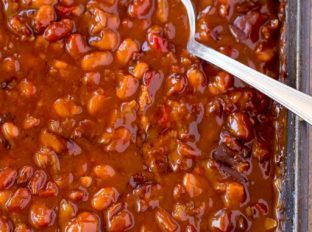 They’re everything and more that you could want from baked beans and I GUARANTEE these are going to be the hit of your barbecue. 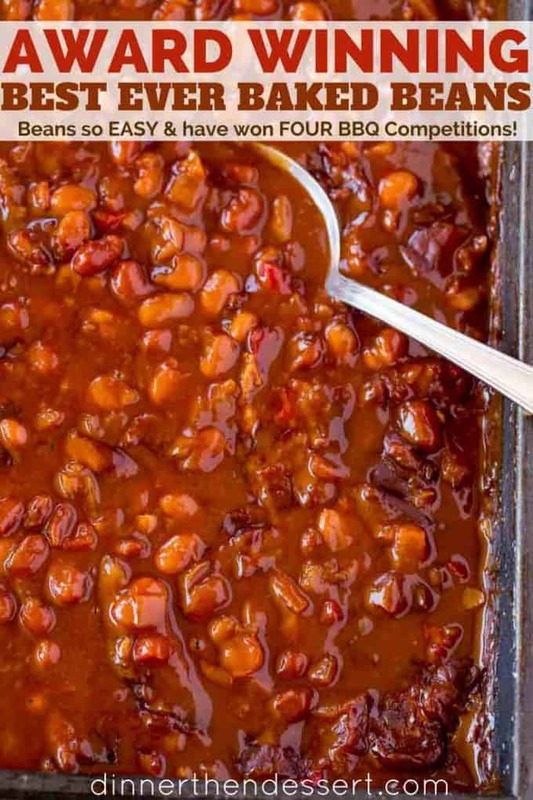 Can you double this baked bean recipe? The best part is the recipe can be easily doubled too. Just make sure your pan of beans are equally shallow. If you pour these into a deep baking dish you won’t allow the appropriate surface area of cooking and thickening to take place and the beans will be too soupy. Another IMPORTANT note, rinse your beans (except the can of baked beans). This reduces the sodium significantly. It also will cut back drastically on how gassy you’ll feel after eating the beans. Want a deeper flavor? Swap the ketchup for bbq sauce, I love using stubbs or Tony Roma’s Original BBQ Sauce. If you want to skip the bacon you can, losing the bacon grease will remove a layer of flavor so caramelize your onions well, the more flavor you can add to the beans the better. After the step of browning the onions and garlic add all the remaining ingredients into your crock pot together and stir. Cook on low for 7 hours, then uncover and cook an additional 1 hour on high heat to thicken. Beans are high in protein and fiber which are part of a healthy diet, but the beans are not considered “good for you” as a general rule because of the added bacon, sugar and fat in the recipe. A healthier option would be beans which are less saucy, with far less sweeteners. 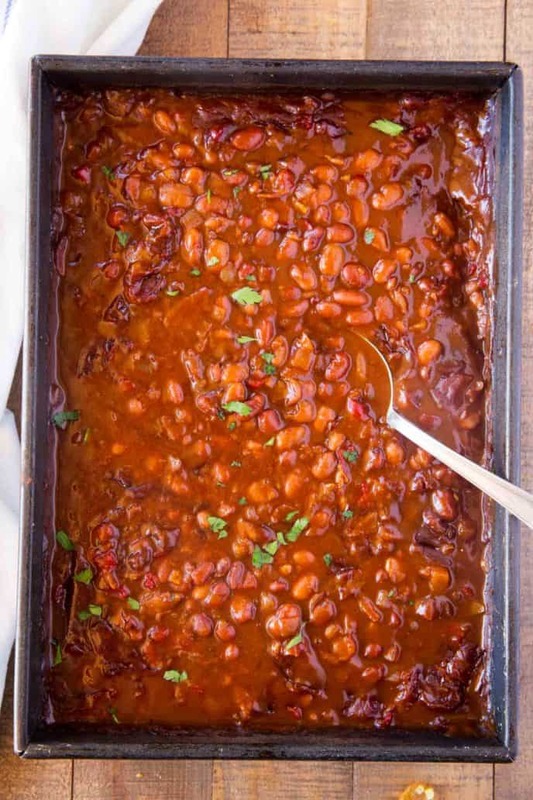 But with summer bbq, these baked beans are the perfect counterpart to a great grilled piece of steak or chicken. How long do you bake beans in the oven? The beans will bake in the oven in a dutch oven for a full hour covered with foil. The foil is removed and the beans will bake for an additional 10 minutes to allow the sauce to thicken up and for a caramelization to take place on the top layer of the beans. How do you make baked beans from scratch? This recipe calls for one can of baked beans as a starter which is not necessary. You can also just add one additional can of beans and pump up the other sauce ingredients up by 25% (we did this in competitions). The ease and familiar flavor of adding the canned beans just seemed to be the flavor profile most of my clients preferred. Which beans do you use to make baked beans? You can work with most types of beans, the most popular are butter, great northern, kidney, pinto beans or navy beans. Some people will use all of one kind, but this recipe has a good mix which allows for different textures and flavors as well. Beans such as kidney beans have a much firmer skin than those of pinto or butter beans which are creamier. In a large cast iron skillet cook the bacon on medium high heat. Remove the bacon and let cool. Drain half the fat, then add the onion to the skillet and cook for 5-7 minutes or until it just begins to caramelize. Add in the garlic and bell pepper and cook an additional 30 seconds, stirring well. In a large mixing bowl add the bacon, onions, garlic and the rest of the ingredients and mix well. Pour the beans into a 9x13 baking pan and bake, covered with foil, for one hour. Uncover and bake for an additional ten minutes. You will lose the different texture and change the flavor by using all one type of bean but it’ll still be good, just different. Enjoy! These truly are the best baked beans! I will make them often – thanks for the recipe! You’re welcome, Joni! Thanks for the 5 stars. I made this for the most part as written except for the Molasses I swapped out with 4 teaspoons of liquid smoke and then I cooked it for 6 hours in my crockpot. It came out excellent with so much depth of flavor and sweet and smokiness to it which I love because it has enough sweetness from the brown sugar I thought that the Molasses would be overkill and I couldn’t find any. Can’t find video. Do I need to add water? And when? I didn’t add any water to this recipe. These beans are the best, I would vote 6 stars if I could…Thanks sharing the great recipe.. Thank you that is so kind of you! I think you may as well use the whole onion. I like fried onions, and I never think you can have too many in a recipe. So unless you have an urgent need for that half an onion in another dish, I suggest you add it to the baked beans. Could you do these on high in a slow cooker to reduce cooking time if serving for lunch?Would rather not get up at 4AM to start them if I don’t have to! I haven’t tested them in a slow cooker yet but these beans only go in the oven for an hour so depending on what time you’re having lunch, you should be ok cooking them the same day. When I went online to find a baked bean recipe, I found yours. So I made it for a Sunday brunch and served it with a “mock” cheese souffle, fruit, etc. Three of our guests who raved about it asked for the recipe. My husband and I loved it and will keep passing the recipe on to those who also want to try it. Rich flavors…..yum!!! So glad you all enjoyed it, Stephanie! Sabrina…I want to make these beans for Thanksgiving, but a couple of folks there are vegetarian….so I will have to skip the bacon….have you tried making this without the bacon? I haven’t but feel free to omit it. Happy Thanksgiving! This recipe is very similar to one I got from a friend who is vegetarian. She substitutes crushed pineapple for the bacon. I’ve just made it (with no added brown sugar – its plenty sweet without). Its been simmering on the stove – for maybe an hour. Very good – don’t see any need for the baking process. My husband made these beans for a work picnic and they are amazing!! 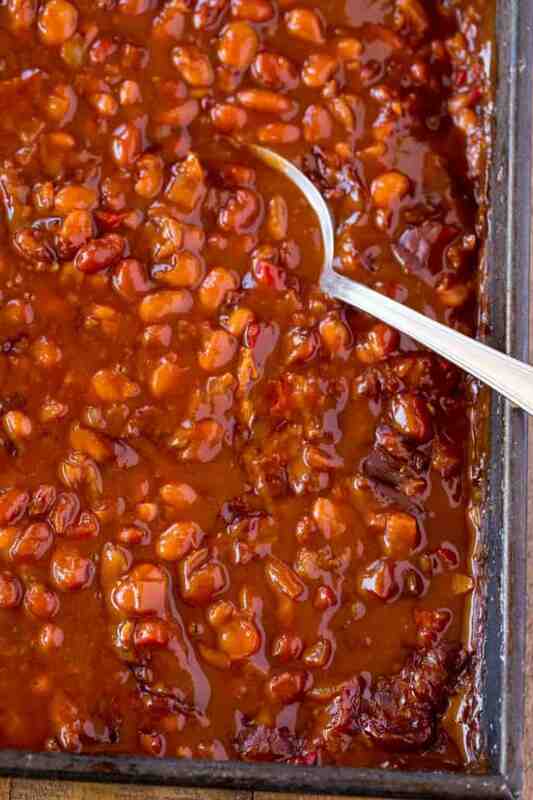 Absolutely the best baked beans we’ve ever eaten, and they were a HUGE hit at the picnic. How awesome, Kim! Thanks for coming back to let me know. I made this recipe for a Labor Day picnic and everyone loved it. So many people said they were the best baked beans they had ever had. How awesome! So glad everyone enjoyed it! Mix all ingredients in a cast iron Dutch oven day before…cook next day. [email protected]°F with lid on for 1 hour…. 1/2 hour @375°F with lid off due to reduced surface area. Sound OK? 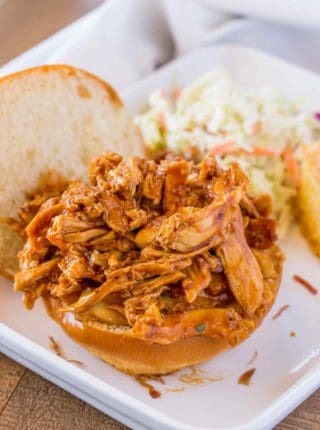 Can you make this recipe in a slow cooker? Yes, after the step of browning the onions and garlic add all the ingredients into the slow cooker together and stir. Cook on low for 7 hours, then uncover and cook an additional 1 hour on high heat to thicken. Enjoy! I am working on a project to encourage people to participate in the 2018 election in Colorado by voting on all the issue measures on the ballot. Colorado gives voters a lot responsibility for making laws by asking them to decide on issues other than candidates. One of our ideas is to create a “Ballot Bash in a Box”. The box will contain a few decorations, branded with our logo (the effort is called Count Me In! ), a thumb drive with a video about why it is important to vote, and some recipes. The material will not advocate for any position on the issues, it will just ask people to be sure to express their opinion by casting a vote. I would love to include this bean recipe under a different name, “Ballot Box Baked Beans”. I would credit you or Dinner then Dessert, which every you prefer. I will not want to use the recipe without your permission. BTW, the beans are terrific! We think so good they will inspire folks to vote. Sounds like a great idea! As long as you mention the blog and link back to me, I’m okay with you using it! Can I make this the day before and reheat it to serve the next day? Best baked bean recipe I have ever made. Instead of transferring to a foil-covered pan, can you bake these covered in the deep iron pot that you saute the bacon and veges in? Also, I have some hard sauce made with good bourbon and brown sugar I’d like to use up. How would I need to adjust recipe for that? Thanks! You can definitely use a deep iron pot instead of transferring. I’m not sure about the additional sauce though. I don’t feel comfortable giving a recommendation on adjustments because I’ve haven’t tested it and wouldn’t want to steer you wrong. If you decide to play around with it and try, I’d love to know how it turns out. Good luck! These were a hit on the 4th of July! We used a slightly different combination of bean types and sizes and wound up cooking for 2 hours for a thicker sauce. A keeper! Thank you! Awesome!! Thanks for the 5 star rating Barb! I made beans from dry in my instant pot and then baked them following the recipe they came out delicious! this recipe is delicious. I’m not a butter bean fan so I used extra pinto beans. I made the beans for my 4th of july BBQ and they were a hit. They were actually better the next day if that is even possible. Baked beans were a big hit! Thank you for sharing this recipe. Delicious! Yay!! So glad everyone enjoyed them! Can I make these the night before and warm them up the next day? Or will that ruin the beans? I like to served them right away but warming them back up definitley doesn’t ruin them at all! Come on – REAL baked beans are made with dried beans. This is a younger generation recipe. Not in the south they aren’t. Canned beans, or even pork n beans are quite common. Forest, not in my neighborhood! Canned beans are only for last-minute emergencies. In NOLA all the original families use dried. I made this recipe. It’s pretty good but I did “up” it in a few places AND I used dried beans, pre-cooked then added to the sauce. How did you do it “up”, if I may ask? Bush’s Baked beans are great! They have been on the market since 1933. That’s 85 years! 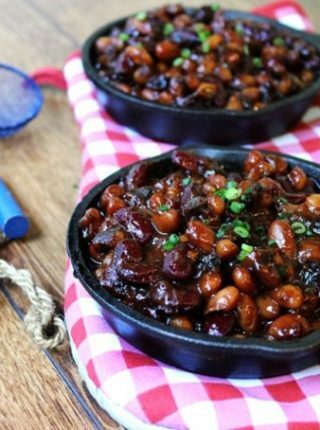 I doubt very much soaking, rinsing and boiling your own dried beans at home can compare to the ease or the flavor in this Baked bean recipe. Yes it may be a younger generation recipe and it is a great one! they are the easiest and have a great favor to them, I am called all the time to bring my baked beans to all party’s we are invited to that will be serving food. Sir I am 70 years old. So I would sy this is not a young person recipe. This recipe won 4 competitions?! I have to give it a try! So glad you enjoyed them! Thank you for coming back and letting me know how they turned out. These look fantastic! My family definitely love these! Oh yeah these are perfect for back yard BBQ! Cans are 15 ounces not 16. Thank you so much for those tips! I will definitely try this! I love that you used different types of beans! I love that they have different sizes and textures. This will be a crowd pleaser for sure! 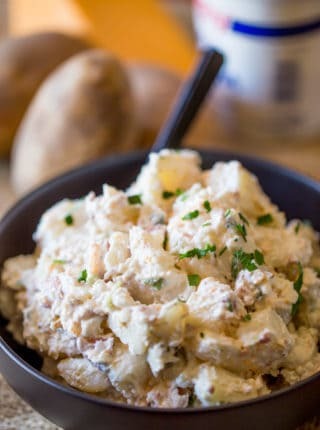 Yum, such a good side dish for Memorial Day!